There’s knockout rugby and Champions Cup places at stake as the provinces move into the endgame of the Pro14. THE EUROPEAN QUARTER-finals are behind us and the new format in the old Celtic League means the end of the regular season is nigh. While two teams on this island have massive European encounters to draw their focus, all four provinces have targets that could deliver a boost either this season or next. Before we go, for those who haven’t been paying attention since August, a reminder that the Pro14 playoffs has now been expanded to six teams. The top seeds in each conference will get a bye from the ‘quarter-finals’ — when second place in Conference A will host the third-placed team from Conference B and vice-versa. The top three (eligible, i.e: no South African) teams from each conference will qualify for next season’s Champions Cup and a seventh berth will go to the winners of a standalone playoff between the fourth-ranked (eligible) teams from each conference. Clear? Here’s a quick rundown of who needs what and why to make sure. The higher the team sits in the current Pro14 standings, the easier the permutations. The road Leinster are headed towards is top spot in Conference B and the bonus of a bye week (before a potential Champions Cup final) as a reward. Zebre (home), Benetton (home), Connacht (away). Italian opposition at home means that, no matter what team Leinster put out, they have every right to expect to deliver bonus point wins. 10 points over the next two weekends should be enough to put Leinster beyond Scarlets’ reach given the champions must take on Glasgow (h), Edinburgh (a) before ending the regular season away to Dragons after the Champions Cup semi-final. For teams who finish level on points in the table, matches won will be the first tie-breaking factor, so if Scarlets did manage maximum points in their three remaining games then three wins (with or without bonus points) would just about suffice to keep Leinster top. 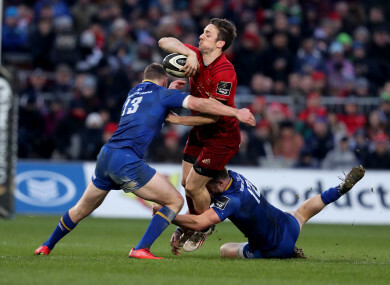 If Leinster slip up in their three remaining games and Scarlets end up level on wins as well as points, then they would also need to make their victories large ones to reel in Leinster’s current 73-point advantage in the points difference standings. A good outcome from here: Two bonus point wins and Scarlets failing to win one match. Johann van Graan has his squad down in South Africa for a two-match tour before the Champions Cup semi-final against Racing 92. Naturally, most eyes will be on European matters, but their performances in George and Bloemfontein will have a huge bearing on how the rest of their Pro14 campaign pans out. Glasgow are 12 points clear at the top of Conference A with an extra match still to play. So as tough as the run-in is for Dave Rennie’s pace-setters is — Scarlets (a), Connacht (h), Ulster (a) and Edinburgh (a) — it’s implausible that they won’t get four points from four remaining games that will see them safe. Munster’s remaining fixtures: Kings (a), Cheetahs (a). Ulster (h). So Munster have to look over their shoulder. The Cheetahs trail Van Graan’s men by six points with Cardiff (h) and Kings (a) to play either side of their home clash with Munster. That altitude-influenced contests represent a golden chance to claim a home playoff match at the end of their first Pro14 season. If the Cheetahs don’t get anything against Cardiff this weekend then Munster should be home and hosed. If we work with an assumption that the Cheetahs do beat the Blues and Munster win with a bonus point against the Kings, then denying the Cheetahs a bonus point when they meet in Bloemfontein will give Munster breathing space. Achieve that and any win over Ulster in the final round of fixtures will keep Munster a nose ahead of their new rivals. A good outcome from here: A bonus point win against the Kings and Cardiff beating the Cheetahs this weekend. Some may argue that the sooner Ulster end this season and move on to a fresh start the better, but before Jono Gibbes finishes up at Kingspan Stadium there is one very important consolation prize to aim for. Ulster remaining fixtures: Edinburgh (a), Ospreys (h), Glasgow (h), Munster (a). Forget a playoff place, even with a game in hand the 12-point gap to third-place Edinburgh looks unassailable (and it will be unless Ulster go and win big in Murrayfield this Friday). Instead, Gibbes’ side ought to be concerned with finishing ahead of Benetton. The Italian side begin their run-in at home to Dragons this weekend, then Leinster (a) and Zebre (h), so they have every chance of putting points on the board to pile pressure on the mis-firing northern province. Let’s presume the (almost) worst and Benetton put up bonus point wins against Zebre and Dragons, then Ulster need at least nine points from four remaining games to finish the regular season in the Champions Cup playoff place. Winning their home games would put them well on the way to that goal, and they should hope Munster have their business wrapped up and also possibly a Champions Cup final to distract them on the final day in Thomond. A good outcome from here: Home wins over Ospreys and Glasgow. A combined two points from visits to Edinburgh and Limerick or hope Benetton slip up at home. As we’ve mentioned before, the Challenge Cup was not the last hope of Champions Cup qualification for Connacht. With the Cheetahs occupying one of the automatic qualification spots in Conference A and South African teams not yet eligible for European competition, Cardiff Blues are almost guaranteed Champions Cup rugby next season. So the fifth-place team in Conference A will play the fourth-place team in Conference B with the seventh Champions Cup spot on the line. At the minute, that 5A slot belongs to Ospreys, just one point ahead of Connacht, so the Westerners must out-perform Allen Clarke’s side before the end of the regular season. Connacht’s remaining fixtures: Ospreys (a), Glasgow (a), Leinster (h). Unfortunately for Kieran Keane’s side, Ospreys will have an extra game to play on the run-in and a considerably lower pedigree of opponent than awaits the western province. After hosting Connacht they will have matches against Ulster (a), Zebre (a) and Cardiff (a) to repair or build on whatever occurs at the Liberty Stadium this Friday. A good outcome from here: Beat the Ospreys in Swansea tomorrow, denying them a point, beat Leinster at home. Then hope Ospreys fail to get more than seven points from remaining matches in Belfast, Parma and Cardiff. Email “Playoff picture: What your province needs from the final rounds of the Pro14”. Feedback on “Playoff picture: What your province needs from the final rounds of the Pro14”.